Kenton's Infotainment Scan: Dillinger's death: is my favorite marketing story a fake? You weren't a fan of Public Enemies? I found it rather disappointing, myself. I hadn't heard the story until I went on the tour. I hope it's true, because that kid sure knew how to take advantage of a situation. I never saw it because I heard it was bad. I once soaked up my own blood with a newspaper, but couldn't find any buyers. I don't have any insights into the bloody-newspaper legend, but I did recently read an interesting article about Dillinger's famed letter to Henry Ford thanking him for the fine construction of his getaway cars. The story is real, but the long-heralded letter is fake; the actual, original letter contained different text entirely and was quietly hidden away for seventy-five years. So don't feel too discouraged if nobody has any insights on the newspaper angle; it seems that Dillinger is just, appropriately enough, a hard guy to nail down the details on. Quite the marketing savvy on Ford's part, though, ain't it? Wow - great info. Thanks, James! I was very disappointed to hear that public enemies was bad. Dillinger was my hero when I was a kid and the other movie made about him in the fifties was garbage. His is a story that is very much deserving of a good movie. Johnny Depp is too much of a pretty boy for the role, and from what I heard, there was little action in the film. We actually watched Public Enemies over the weekend; Dave might put it down to Depp's "prettiness," but I don't think the roughest-looking of actors could have saved the awful writing. 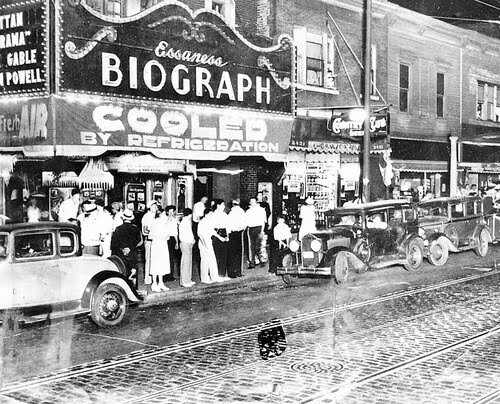 The movie didn't show anyone dipping anything in Dillinger's blood - or leave any doubt as to whether the body was actually Dillinger's, as our tour guide also did. I also heard the writing was terrible. Very much a shame, Dillinger was a compelling story.